Showing results for tags 'weetabix7'. Hello everyone it has been a couple weeks since I have checked in. I have made a lot of changes to my tank since I have last posted. Today I am very excited I took my Colt coral back to the LFS it was becoming to big for my tank. I am super excited because I replaced it with a bubble coral I have always wanted one. But the guys at another LFS I stopped going to kept talking me out of it as they said it is impossible to care for. So I look forward to the challenge. I also added a torch and trumpet. Which I will post pictures tomorrow, I just added them tonight so not much to take pictures of. Lol. I added a watch men goby to help shift the sand around. 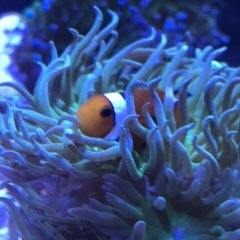 Update on my clowns they are doing really well. My hammer frogspawn and green star polyps are growing really nicely. Which is pretty excited to watch. My Xenia already grew another stalk which I can't believe happened this fast. The Duncan seems to be doing well. One of my favorite corals to feed. I just have to watch because the cleaner shrimp loves to steal his food. The red flower pot despite what the LFS told me is doing extremely well. I would like to thank this form for all they good advice you men/women have given me. I look forward to posting some pictures tomorrow to share with you.